The following terms govern the access, viewing or use by you (hereinafter referred to as the “User” or “You”) of www.sipfund.com (hereinafter referred to as the “Website”). The Website is owned and operated by Gade Capital Services Private Limited, an Indian company with its registered office at Splendid Plaza, L3 - L07 Second Floor, No. 26 Wheeler Road, Cox Town, Bangalore 560005 (“ Gade Capital”). Any undefined capitalized terms used herein shall have the meaning given to them in the Order Documents. User Information shall mean any information provided by the User including name, nationality, date of birth, telephone number, email address, physical address, bank account information and the like. Offer Documents is a collective term for the offer document, Scheme Information Document, Statement of Additional Information, Key Information Memorandum, issued by the Asset Management Company that manages the Mutual Fund. Mutual Funds shall mean various Mutual Funds registered with SEBI. You agree and understand that this Website and the contents are intended for people who are of the age of 18 years or above. You hereby represent that You are 18 years of age or above and competent to contract. You understand that for the purpose of accessing all the content including paid content available on the Website You will be required to create an Investment Account and for this purpose will need to register and provide accurate information including User Information. You represent that You have all rights required to provide the information that You have provided to the Website, including the User Information and represent that the information is true and accurate. Once a password has been provided to You, You will be solely responsible for maintaining the confidentiality of the password and agree that the password is intended for use solely by You. Gade Capital may in its sole discretion permit or deny Your registration. You will be solely responsible for Your acts and omissions on the Website including those conducted under the username assigned to You. You understand and agree that Gade Capital may, in its sole discretion, terminate Your access to the Website without notice and You waive any right to claim access to the Website or any other claim that You may have. Any data of Your usage may be retained or deleted at Gade Capital’s sole discretion. You confirm that the information provided to during your registration on the Website are true and correct. You are solely responsible to keep the information current and accurate. You confirm that You are 18 years of age or older and where You are acting as a guardian for a Minor You have necessary authority to register under this Website and execute investment transaction on behalf of the minor. Execute the ECS/NACH/Direct Debit mandate provided by you to Gade Capital, subsequent ECS/Direct debit instructions related to your investments and electronic money transfer instructions through online payment gateway(s). Carry out all mutual fund subscription/ redemption/ non-financial instructions ("Instructions") which You provide through the Website using the e-mail ID and password then associated with your Investment Account. Communicate with the AMC on Your behalf for Transactions and to receive details of your investment from the AMC. You have applied for an Investment Account on the NSE through the Website after understanding the nature and scope of services provided by the Website. Your identity on the Website is authenticated by the use of Your login credentials. The Website will consider Instructions authenticated by Your login credentials to have originated from You. You have the right to transact directly with the AMC even in respect of the investments made through the Website. Recommend and offer a platform for investment in Mutual Fund schemes. Facilitate subscription and redemption of Mutual Fund Units by transmitting Your money and Instructions to the appropriate AMC, as per Your Instructions. Securely and confidentially maintain a record of Your Personal Information and Your financial transactions. Promptly & efficiently respond to my queries relating to my online investment account. Ensure that the money You invest is from Your bank account (primary holder's bank account in case of an Investment Account held jointly), is from legitimate sources and is remitted through approved banking channels. Make an informed investment decision by reading the Offer Documents of the Mutual Fund schemes that You are investing in. Seek independent financial planning, legal, accounting, tax or other professional advice before investing or withdrawing. Your Investment Account will be activated after Gade Capital verifies your personal information in accordance with the Know Your Client ("KYC") guidelines issued by the Securities and Exchange Board of India ("SEBI"). The Website does not, and is not obliged to, offer all mutual fund schemes for investment. By limiting the number of schemes on the Website, the Website does not make any representation as to the quality, bona fides or nature of any AMC or mutual fund scheme, or any other representation, warranty or guaranty, express or implied. For investments using ECS/NACH/ Direct Debit, the Website will first submit the fund transfer instruction(s) to Your bank. Your request for subscription will be sent to the AMC only after receiving confirmation of successful money transfer to the AMC's account. Consequently, there may be a lag between the date of debit to Your bank account and date Gade Capital submits Your request to the AMC. Subject to point no. d., Your Instructions will be processed the same day if received before the cut-off time(s) specified by the Website. Else, Your Instructions will be processed on the next business day. The Website may specify cut-off time(s) earlier than the time(s) specified by the AMC/ SEBI. The Website will forward Instructions to the AMC electronically via NSE platform and the AMC will process the Transactions on the basis of such electronic instructions. AMCs are not obliged to accept Your application for subscription to Units of their Mutual Fund schemes in part or in full. For Investment Accounts held jointly, the Mutual Fund folios maintained by the concerned AMC will also be held jointly and all the individuals will have the same authority to operate those folios (Any or Survivor). The data and information provided on the Website does not constitute advice and shall not be relied upon by You while making investment decisions. Any disclosures made by Gade Capital to any statutory body under any law. delays either at the Bank, Registrar and Transfer Agency, NSE or AMC. rejection of Your Instructions by the Bank, Registrar and Transfer Agency, NSE or AMC. non-availability or non-accessibility of the Website, telephone(s), or office(s) of Gade Capital in case of circumstances beyond Gade Capital's control. Mutual Fund investments are subject to market risks, read all scheme-related documents carefully. You will use the Website and any information available in accordance with all applicable laws and regulations. You retain ownership of any intellectual property rights that You hold in any content You submit to the Website. When You upload or otherwise submit content, either as a comment to content available on the Website or as a blog post or any other contributions to the Website, You grant Gade Capital and its third parties a global, perpetual, irrevocable, fully paid up, royalty free right to use, host, store, reproduce, modify, create derivative works (such as those resulting from translations, adaptations or other changes Gade Capital or its third parties make to your content so that your content works better with the Website), communicate, publish, publicly perform, publicly display and distribute such content. You will be solely responsible for all the content you submit to the Website and agree to defend, indemnify and hold harmless Gade Capital, its directors and officers from any and all claims that arise from the publication of any such content on the Website. use the Website for any unauthorized marketing purposes or for sending any unsolicited materials including but not limited to uploading, posting, emailing or otherwise transmitting any unsolicited or unauthorized advertising, promotional materials, "junk mail”, "spam”, "chain letters”, "pyramid schemes” or any other form of solicitation, except in those areas that are designated for such purpose. the contents of the Website including but not limited to the information, logos, designs, databases, arrangement of databases, user interfaces, response formats, software, audio, pictures, logos, icons, text, illustrations, images, scripts, graphics, music, video, content, materials, products, services, URL’s, technology, documentation are the sole property of Gade Capital or its licensors. All intellectual property in and to the Website and its contents and functionalities shall vest solely with Gade Capital or its licensors. The content provided in the Website is solely for Your personal, non-commercial use. You may not modify, copy, link, reproduce, republish, upload, post, transmit, translate, sell, create derivative works, exploit, or distribute in any manner or medium any content from the Website. To the extent required, You grant to Gade Capital a non-exclusive, royalty free, worldwide, transferrable, sub licensable right to host, display, demonstrate, publicly perform, use, reproduce, format, and distribute any materials, trademarks, trade names and other forms of Your intellectual property which You have provided to Gade Capital. You have no rights to remove, modify (including removing any copyright notices or proprietary markings) any part of the Website save for any User Information that belongs to You. You have no right to use any search mechanisms other than that provided on the Website and You will not use any web-crawler or any data harvesting tools to harvest data of any sort from the Website. You agree and understand that the contents and services on the Website are available on an “ as is” basis. the Website or any content is free from viruses or other malware. You expressly release Gade Capital and where applicable its director, officers and representatives from any cost, damage, liability or other consequence of any use of the Website by you or the actions of the Users of the Website. Subject to applicable laws, Gade Capital hereby disclaims all warranties, whether express or implied, in relation to the Website, its contents and functionalities, including but not limited to warranties of merchantability or fitness for a particular purpose. Where applicable laws do not permit the disclaimer of warranties to the extent detailed above, the said warranties are disclaimed to the maximum limit permitted by applicable law. Gade Capital reserves the right to remove any content from the Website. The Website may contain links to third party websites. Gade Capital shall not be responsible in any manner for the contents of these third party websites and if You should choose to use the link to view the third party websites, You choose to do so at Your own risk. Gade Capital does not endorse the contents nor in any manner represents the accuracy or correctness of information on such third party websites. Please provide Your name, email address, physical address and contact numbers so that Gade Capital may be in a position to verify details or check the authenticity of the complaints. Termination: Gade Capital reserves the rights to terminate Your access to the Website at any time, in its sole discretion. You acknowledge Gade Capitals’ right to do so and waive any claim that You may have arising from such termination. Notwithstanding the termination of access, all provisions which by their nature are intended to survive, shall survive termination and continue to be applicable. Access: This Website is intended for viewing in India, Gade Capital does not make any claim that the Website and its contents may be lawfully viewed or accessed in the jurisdiction You are viewing it in. You are solely responsible for complying with laws applicable to You. Welcome to SIPfund.com a platform for investment in mutual funds – Systematic Investment Plan and Lump sum. 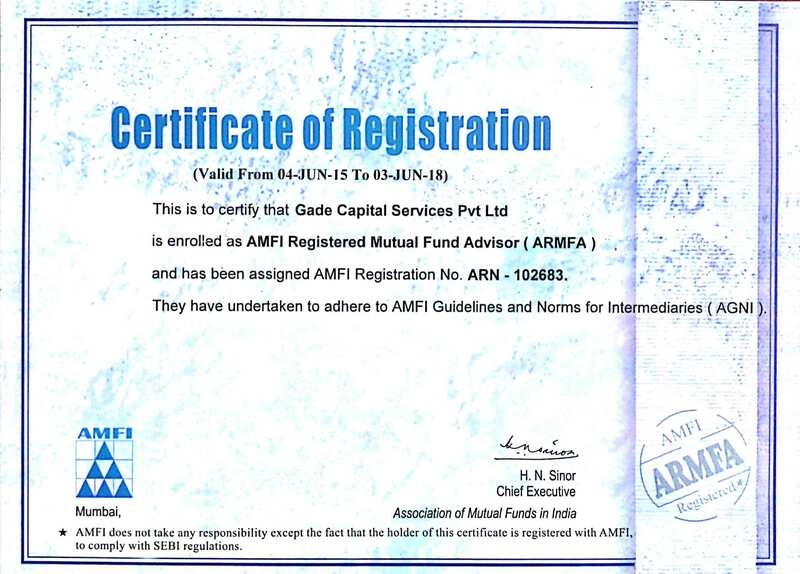 SIPfund.com, an online portal of GADE Capital Services, encourages long term saving through investment in mutual funds, provides aggregation and designs client specific portfolio. Copyrights © 2016 All Rights Reserved by SIP Fund.